Landing Craft, Air Cushion (LCAC) amphibious transport vehicle. The U.S. Navy successfully concluded its final alternative fuel demonstration for the year today with the Dec. 7-9 operational tests of the 50/50 algae-derived, hydro-processed algal oil and petroleum F-76 blend in a Landing Craft, Air Cushion (LCAC) amphibious transport vehicle at Naval Surface Warfare Center Panama City. 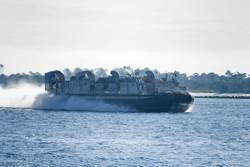 The tests also marked the fastest speed achieved to date by a U.S. Navy surface craft using alternative fuel blends, as LCAC 91 reached speeds the crafts maximum speed of 50 knots, Dec. 7. The fastest speed demonstrated on the 50/50 algal blend in previous tests was 44.5 knots by the Riverine Command Boat (experimental) (RCB-X) in October 2010 at Naval Base Norfolk, Va.
"Our Navy is working to be resilient to any potential energy future. Pursuing sustainable resources, such as alternative fuels that are drop-in replacements, assures our performance and mobility while protecting us from the volatility of the fossil fuel market. This demonstration is another Wright Brothers-moment for the Navy. We have shown that we can achieve more than 50 knots on the water and Mach 1.7 in the air - all on biofuel blends," said Rear Adm. Philip Cullom, director, Chief of Naval Operations Energy and Environmental Readiness Division. LCACs move elements of a Marine Air/Ground Task Force - weapons systems, equipment, cargo, and personnel - from ship to shore and over the beach. The vehicles have four gas turbine engines, and two generators that traditionally run on NATO F76 or NATO F44. They have a 7,000 gallon fuel capacity, an average range of 200 nautical miles, and can carry up to 150,000 lbs. "For the test, the craft was operated out in the Gulf of Mexico using two different fuel configurations so we could compare the craft's operations as powered by each fuel type," said Naval Sea Systems Command's Navy Fuels Engineering Manager Richard Leung. "After draining the diesel, LCAC 91 received approximately 5,000 gallons of the 50/50 algal blend. We assessed the engine performance capabilities on the biofuel blend, and collected data on engine torque, acceleration rates, craft speed, fuel flow rates, propeller pitch, compressor discharge pressure, and inlet and exhaust gas temperatures"
Mechanical engineers bore scoped the engines and collected the technical data. LCAC operators then provided input on how the craft performed and operated. "We are going to compare how the engines performed during the test both on the straight diesel and on the 50/50 mix. Results from the comparison will help us assess the performance of the fuel," said mechanical engineer Ben Canilang, NSWC Carderock's Naval Ship Systems Engineering Station, Philadelphia, Pa.
"To see what type of numbers came out, we connected a laptop with a harness that read into our digital and analogue data collectors," said mechanical engineer Peter Diamond. "The type of analysis is simply comparing numbers. We'll plug in a stream of numbers and compare results from each of the tests." "The test run on the 50/50 alternative fuel mix was very successful," said Scott Feenstra, mission director, Landing Craft Air Cushion, NSWC Panama City Division. "LCAC 91 performed without issue. The operators were able to use high power; and reported that the craft handled beautifully and without problems." Meeting the secretary of the Navy's call for a drop-in fuel replacement, no changes were required to the LCAC or fueling equipment infrastructures for the test. Alternative fuel efforts also support the secretary's overall energy strategy to increase energy security and safeguard the environment; as well as his goals to demonstrate a Green Strike Group by 2012, and deploy a strike group composed completely of alternatively powered ships,"The Great Green Fleet," by 2016.